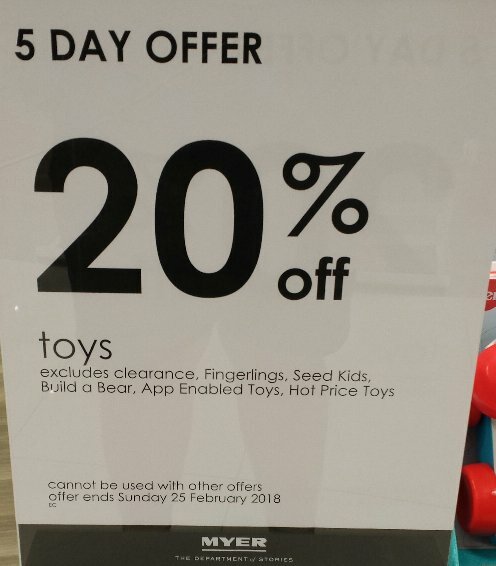 20% off toys at Myer for 5 days - Wednesday FEB 21st to Sunday FEB 25th. Last edited by griffin; 26th February 2018 at 07:46 PM. Yeah....I picked up the last Grimlock when I got there....sorry about that. Hopefully PotP arrive at other department stores soon (Kmart, Big W, etc). I was there Wednesday and definitely seen PotP Hot Rod and some other leaders. They had probably a dozen of him. Yeah, I probably got beaten to it. I was there on the Friday. I'll try again sometime next week. Yeah I was there the other day and only Leader Soundwave. I was quite disappointed. I haven't even seen Optimus in store yet.